The valves in your engine open and close to allow intake air to flow into and exhaust gases to flow out of your engine. The method that Honda uses on all their motors is a rocker/follower that rides on the cam lobe (with the crankshaft and timing belt/chain turning the cams) that actuate the valves. The cam has a "lobe" for lift and a "base circle" for the duration of the engine rotation where the valve is closed. 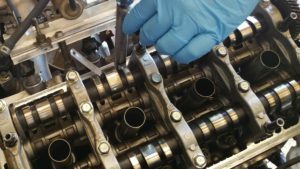 In order to insure that the valves close completely the "valve clearance" or "valve lash" is set so that there is a known clearance between the valves and the rocker arm. The valve adjustment is important for two reasons. First, if the clearance is set too tight, when the components heat up and expand under normal operation, clearance is reduced and the valves may not close all the way. In this case, you can lose a substantial amount of power since the intake mixture will be "squeezed out" during the compression cycle through the open valve (hence less mixture burned, less energy resulting from combustion) and may allow combustion gases to escape after ignition, resulting in less energy being transmitted down through the piston and rod to the crankshaft. This might also result in burned valves as the exhaust valves depend partly on contact with the valve seat (head) for cooling. Second, if the clearance is set too loose, valves do not open all the way, the maximum lift (opening) of the valve is effectively reduced, as is the time (duration) which it is open. This results in reduced airflow through the head (less mixture pulled or expelled on the intake or exhaust cycle) and again, will result in lost power. As the engine ages and more miles are put on it, the valve clearance can change. Repeated thermal cycling of the components as well as mechanical wear will alter the adjustment slightly, resulting (typically) in increased clearance. This increase in clearance is usually characterized by an increased “ticking” at idle. While Hondas generally run wide enough clearances to tick some at idle, if you notice a more pronounced ticking noise, you should probably consider having this adjustment performed. The adjustment usually takes 1-2 hours on a typical Honda. 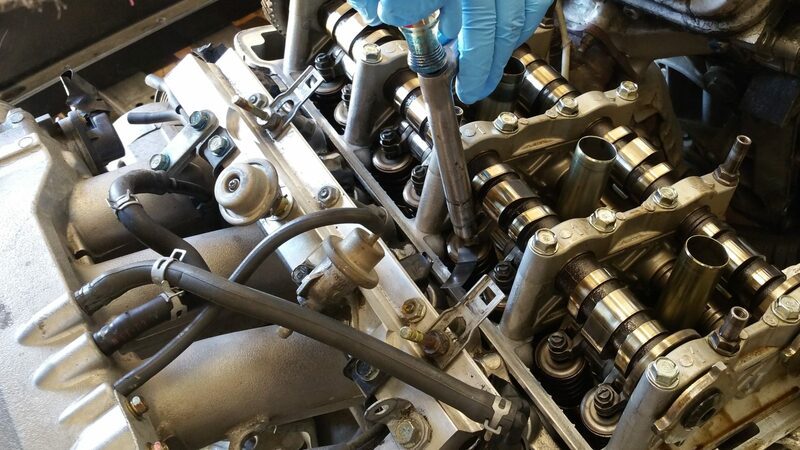 Since the adjustment needs to be done with the engine cool, there is usually at least a 3-4 hour cooldown period that must preface the actual adjustment. The valves must be adjusted at near the specified temperature, since as little as 30 degrees F will change the clearances. Most dealers and independent shops will only charge for the work done (and not the wait time), or simply charge a flat fee. Regardless, this is typically a job that costs $70 to $150, depending on the facility. Marcucci Motorsports is on the low end of that spectrum, typically charging only $70 for labor. Keep in mind that unless the valve cover gaskets were replaced recently, this will likely need to be replaced. Contrary to what some shops will tell you, if the gaskets are not leaking, and are not old or cracked, they will not need to be replaced. The gaskets can be reused numerous times, usually an unlimited amount, up to about 7 years of age when they become less compliant due to age. Depending on the generation of the vehicle, you may set this adjustment by measuring the clearance between the valve and rocker or the rocker and the cam. Since the two are related geometrically by the length of the rocker (and where it pivots), it is crucial that you know the clearance for your engine and where exactly to measure it. It is also crucial that you know what temperature the spec is at. This information is of course included in the Honda factory service manuals, which Marcucci Motorsports has an uses for all the vehicles we service. Honda specifies a range of acceptable clearance. When inspecting valve adjustment, any value within this range is considered acceptable. When setting valve clearance, though, we always recommend setting the valves to the tight side of the range. This generally buys more “insurance” with respect to extended clearance inspection intervals, and will result in slightly increased power (vs adjusting towards the center or loose side of the spec). Contact us to inspect or adjust your valve clearance. This minor item can result in a major improvement in reliability, and also help increase performance.